707005 arrives into Syon Lane with the very first passenger class 707 run, the 09:28 additional from Brentford to Reading. 707005 and 707003 pause at Ascot. 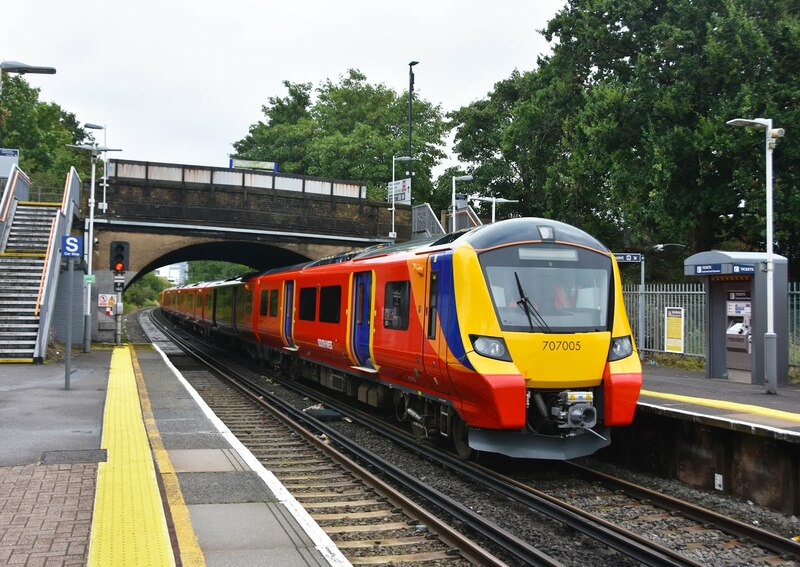 Somewhat later than the planned date in April, South West Trains class 707 'Desiro City' EMU's finally entered passenger service on 17th August with just three days left to run on the franchise. 707003 and 707005 were the first units to be accepted into traffic by SWT from Siemens and this pair worked a number of special trips on 17th August beginning with a 1Z31 09:28 Brentford - Reading which was the units debut into passenger service. The train worked several more trips during the day, the majority being on the route from Staines to Reading. How busy is this train? Not very- the first run did however pick up a number of passengers at Ascot and Wokingham. The interior of the trains is similar in style to the class 700 operating on Thameslink. The South West Trains units feature a mix of 2+1 and 2+2 seating with plug sockets and WiFi throughout. Toilets are not fitted though provision is made that these could be installed at a later date if required. again before the franchise change on 20th August. In total 30 class 707 units were ordered for metro and suburban work by South West Trains. Controversially the new franchise holder, First/MTR which will brand the network as 'South Western Railway' from Sunday 20th August announced that the 30 brand new trains would not play a part in their plans. The class 707's will continue to be accepted into service as part of existing plans to extent suburban trains from 8 to 10 coaches and will run until delivery of a new fleet of Derby built Bombadier 'Aventra' trains is delivered to South Western Railway, likely to be in 2020.